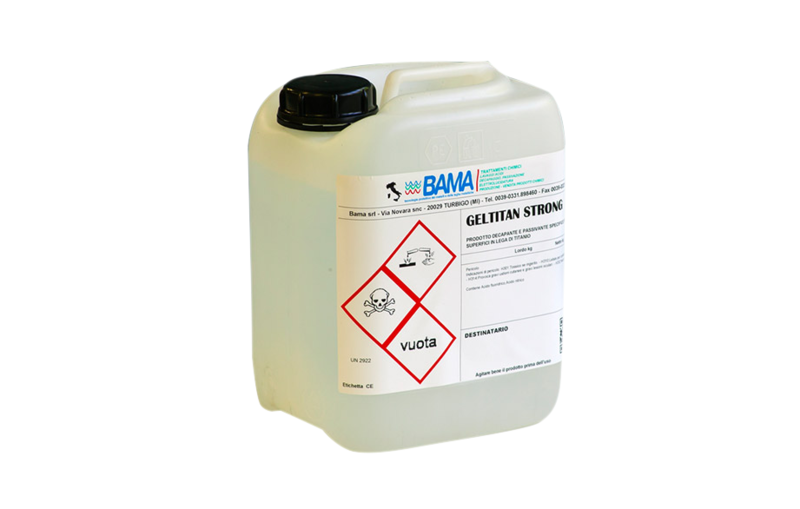 BAMA GELTITAN STRONG is a high viscosity product that has a DECAPANTE AND PASSIVE action on TITANIUM and its alloys. BAMA GELTITAN STRONG is particularly effective at removing any trace of welding oxidation. BAMA GELTITAN STRONG adheres instantly to the surface to be treated, without causing any dripping phenomenon. BAMA GELTITAN STRONG can be applied to the surface to be treated by spray or brush. Spray application is suitable for large surfaces, while brush application is suitable for small or well-defined areas (e.g. welding). BAMA provides all the necessary equipment for a correct application of the product. The time the product remains on the surface to be treated depends on the titanium alloy, the operating temperature and the extent of oxidation on the surface. BAMA GELTITAN STRONG is available for sale in 1kg, 3kg, 5kg buckets. When applying the product, it is necessary to wear acid-resistant glasses, gloves and overalls and to protect the face from reaction gases by means of a gas mask with a chlorine filter. BAMA GELTITAN STRONG should be stored in a place protected from frost and direct sunlight.